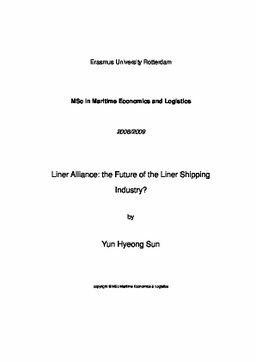 Erasmus University Thesis Repository: Liner Alliance: the Future of the Liner Shipping Industry? Liner Alliance: the Future of the Liner Shipping Industry? As the dramatic market changes in the liner shipping business have continued, triggered by the increasing power of shippers, an unexpected world economic downturn, trade imbalance and the trend of trade multipolarization in the world, many liner companies have worried whether they would be able to survive in the current market or not. In this situation, many liner companies that are already participating in liner alliances, as well as those which were considering joining already existing alliances or organizing new alliances, have been confronted with new challenges. Generally, when liner companies are conducting strategic alliance, what is first required is the formulation of a clear process of alliance objective. Next there is the evaluation of partners, negotiation, and the selection process. However, in the liner shipping business, due to its own characteristics, there are also additional requirements that are indeed different from other business sectors. In this paper, I will begin by reviewing the previous literature and studies related to the liner shipping business and liner alliances. Next, I will focus on the historical changes in the liner business and the recent trends of massive and powerful collaborations and liner alliances. In this study, I propose 10 factors which can help in determining whether liners should participate under particular circumstances. I have used the survey method and by looking closely at the responses, the research hypotheses are verified. The aim of the thesis is to explore the implications of changes in liner alliance as well as to determine the main prospective trends of liner alliance in the future. Finally, I would like to present some concluding insights for the decision makers at liner companies to help them in determining their own strategies for the future liner shipping market.